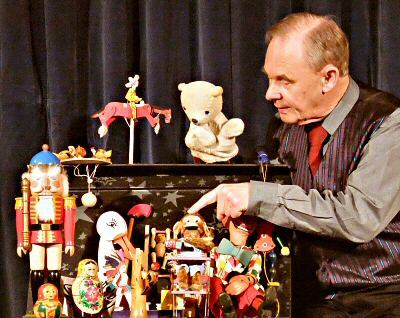 Chris Somerville's Children's Show combining Magic and Punch & Judy is always delightful for the end of term treat and early bookings are especially suggested for the Christmas period when Chris is heavily in demand when everybody wants the same last two weeks of term. 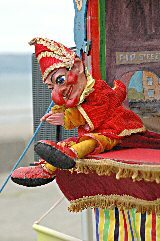 During term time Chris offers a variety of Workshops including a Punch and Judy Workshop, where he talks about the Punch and Judy tradition, and how it came to be associated with the Seaside. The fascinating story of how Mr Punch came from Italy to London as a string puppet, recorded by Samuel Pepys, how he transformed into a glove puppet and became a popular Victorian street entertainment, and how he followed the crowds to the seaside can be presented at a level to be appreciated by infants or juniors, and can fit in with projects on the Seaside Holidays of the past or Victorian Street life. The talk is illustrated with pictures and puppets, and includes a performance of the traditional show, and can finish with a Question and Answer session. While this workshop can be compressed to a single period a longer session is preferable. There is a web presentation which the children can view after Chris's visit. This reviews what they have learned and offers relevant pictures to download and print. Chris can present a Puppet Workshop featuring puppets from around the world, showing the various kinds of puppets and suggesting ways in which they can be made. This is especially suitable if the children have a puppet making project themselves. This workshop can also finish with a performance. 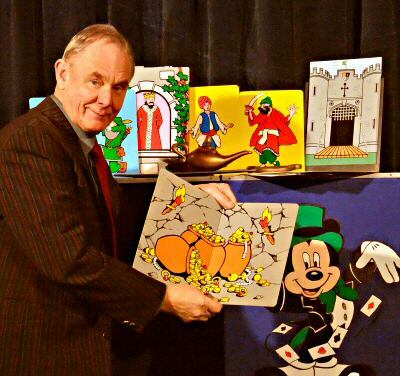 Mr Bimbamboozle's Once Upon A Time Magic is a show featuring well known stories told by magic and designed to encourage the children to act out parts of a story and explore alternative outcomes. Chris also collects Historical and Mechanical Toys and has prepared a schools workshop in which he demonstrates a plethora of toys from his collection. This can be angled towards a "playthings of the past" and the way they have changed or a design-technology discussion of the materials they are made from and way they are made to move. Teachers who are interested in any of the workshop presentations are invited to contact Chris to discuss this in detail.